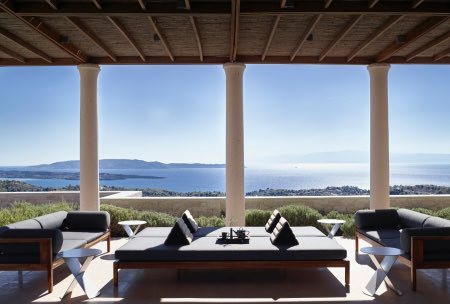 We’re delighted to introduce you to Villa Kalya, a beautiful villa located within the Panacea Retreat. 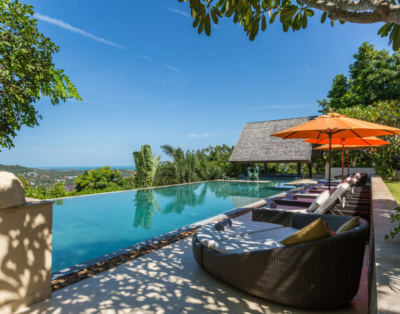 The name Kalya means “health” and you certainly will feel the calm and relaxing atmosphere of this property and its surrounding. 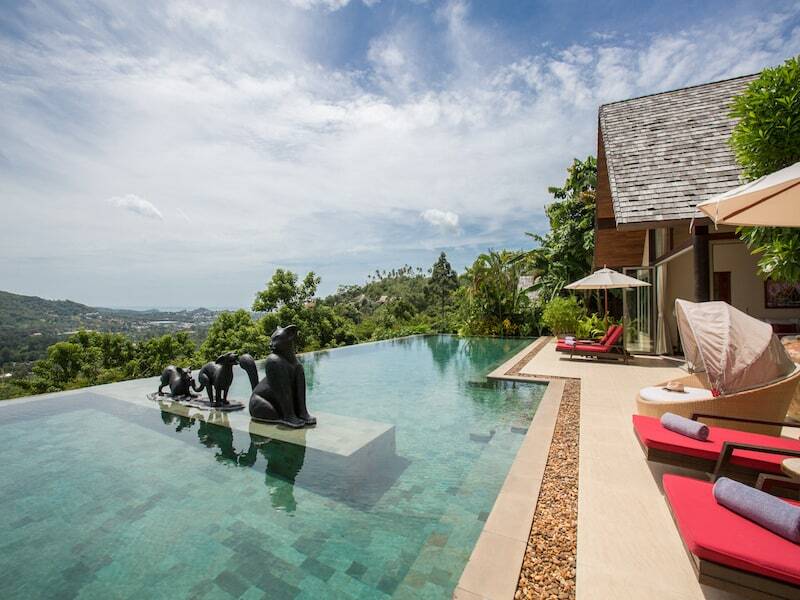 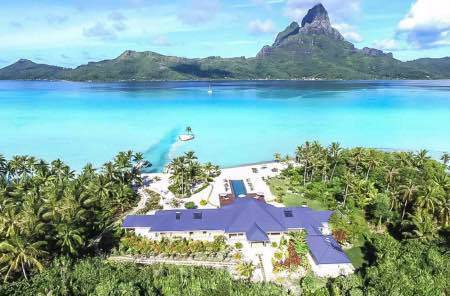 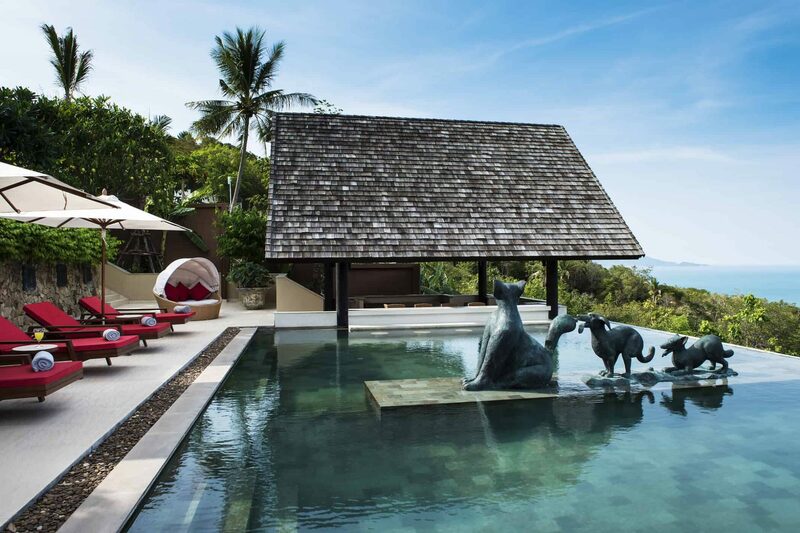 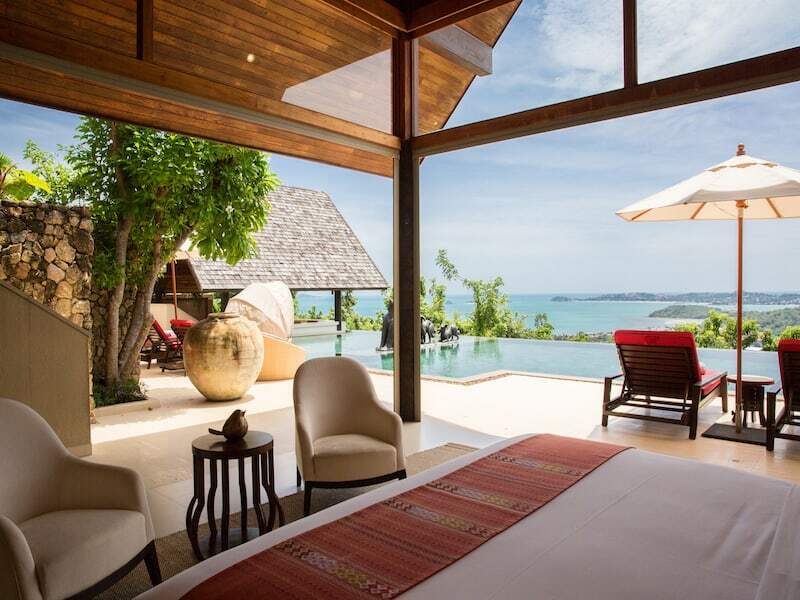 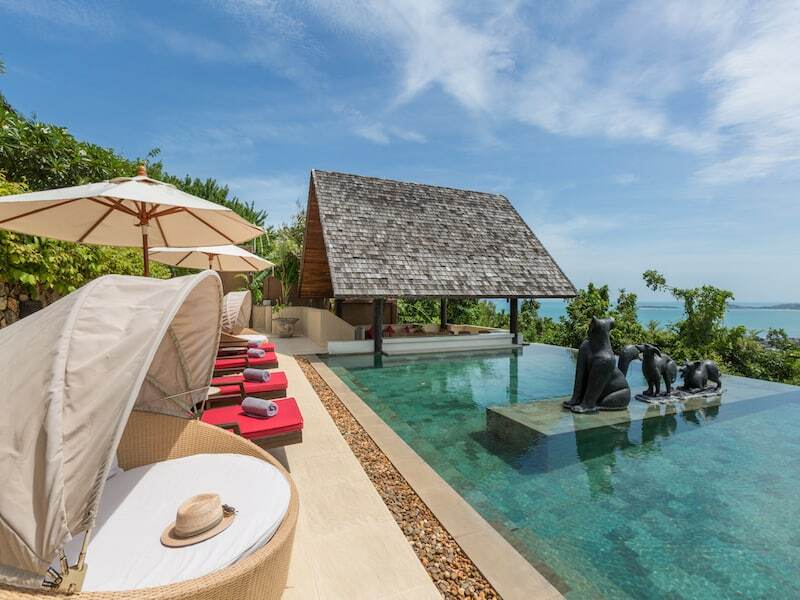 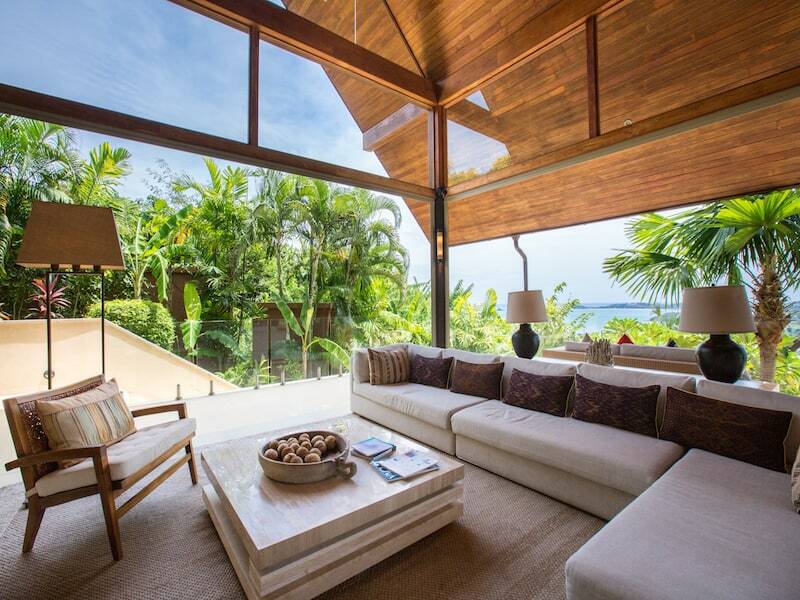 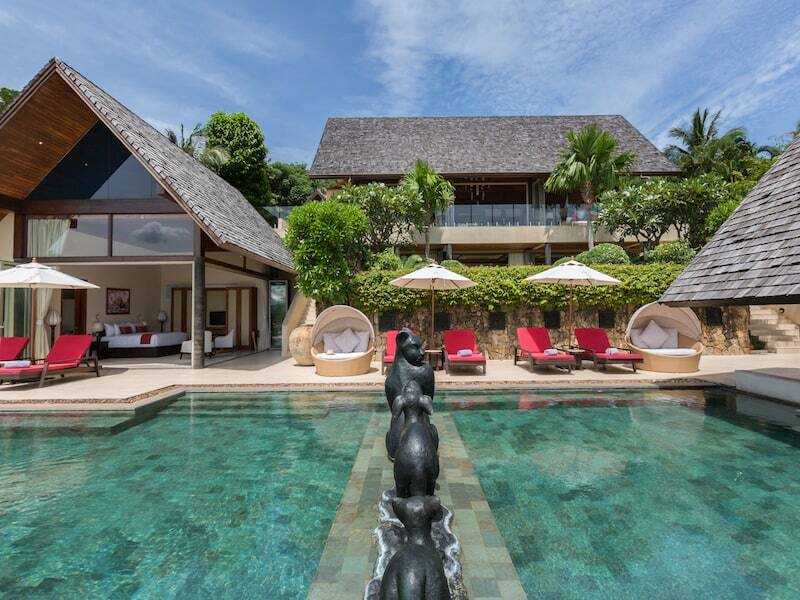 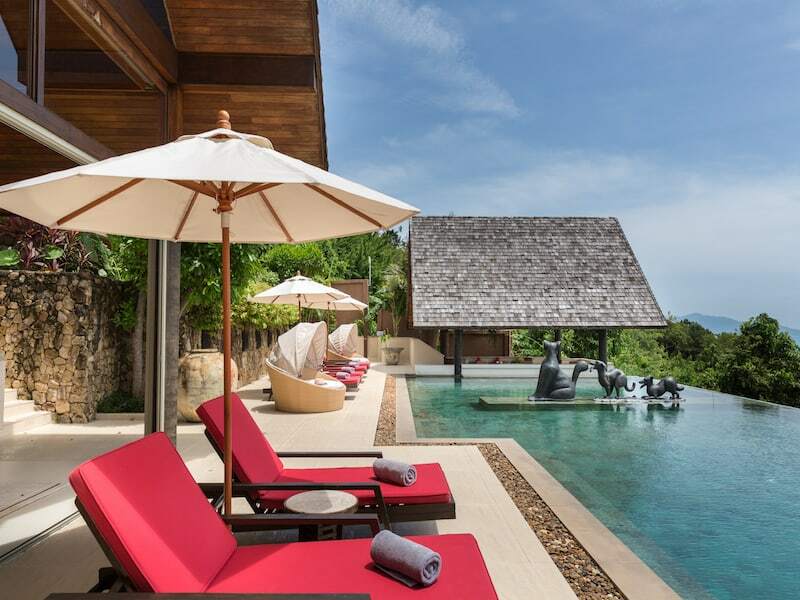 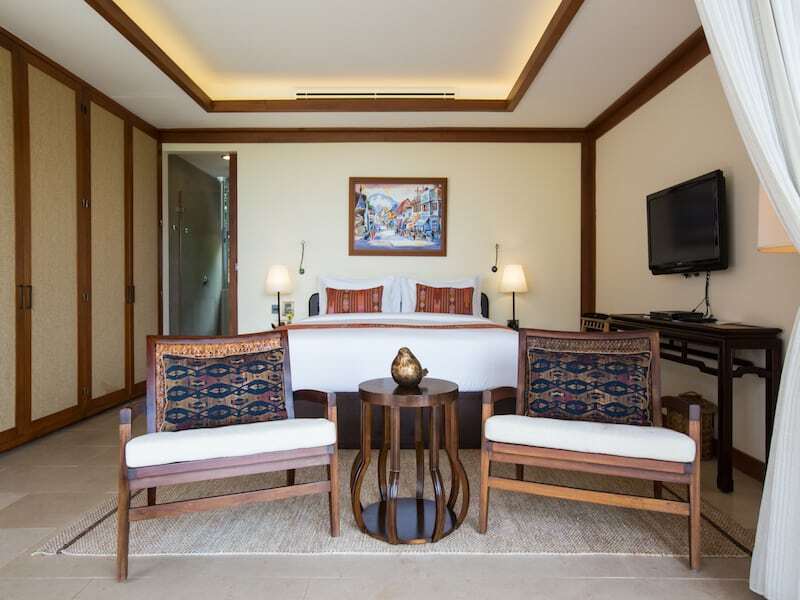 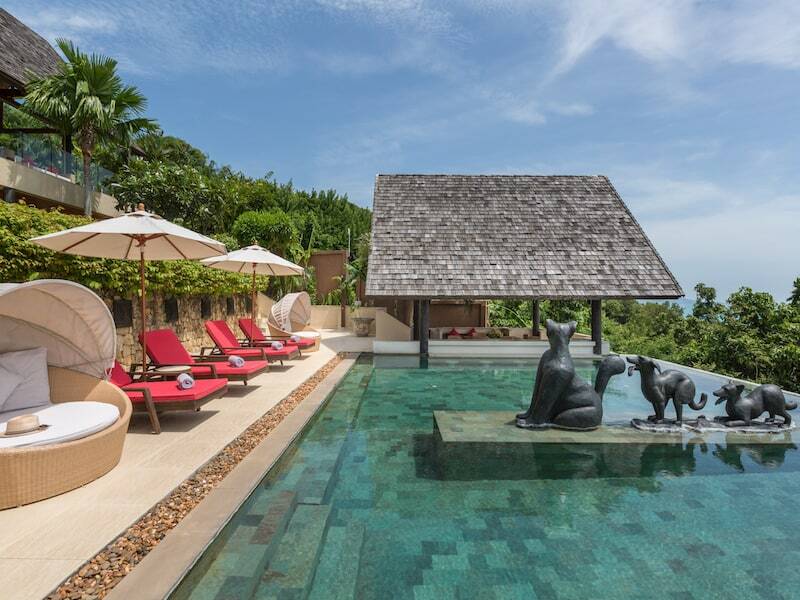 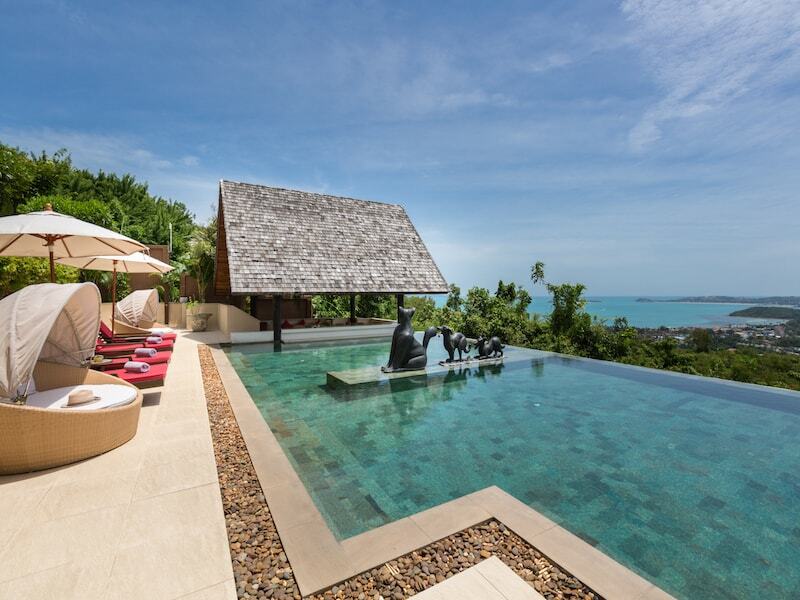 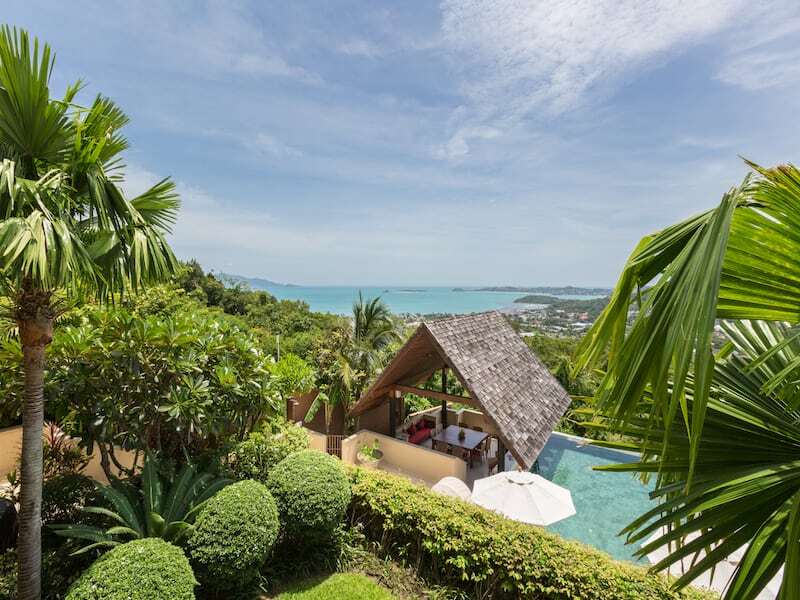 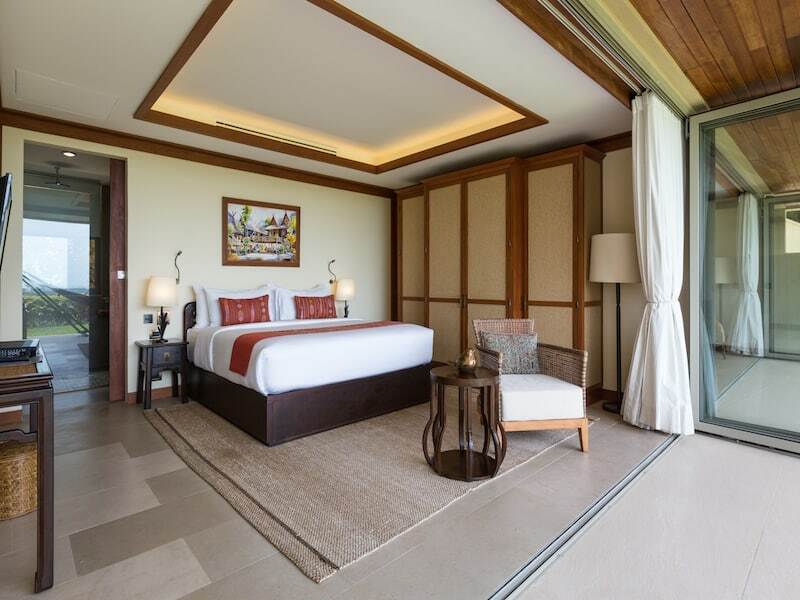 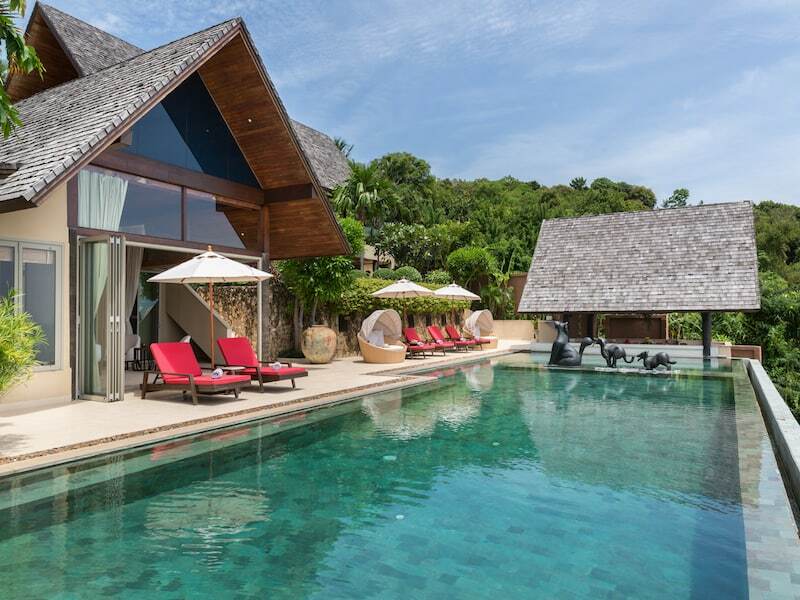 Kalya Residence is a sophisticated and elegant villa that blends striking architectural features, exceptional furnishings, natural materials and a scintillating sea view from every room. 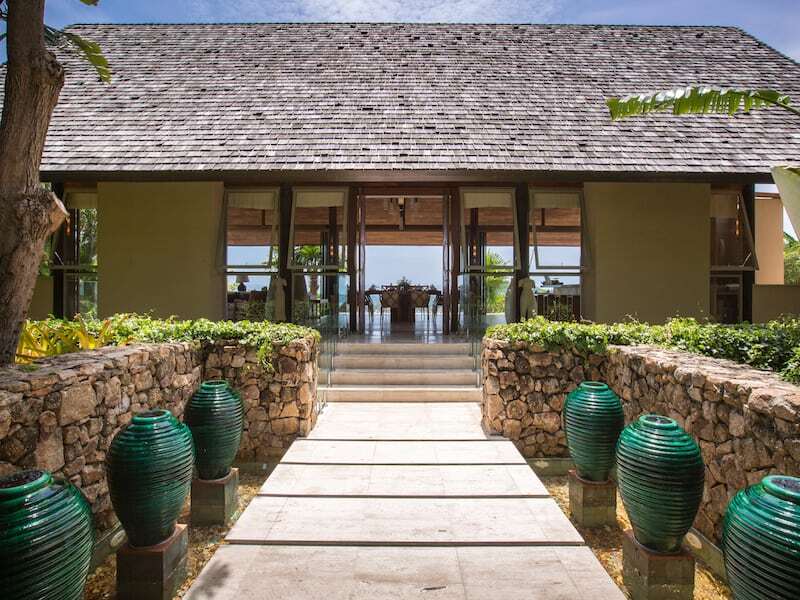 Step inside, the villa opens to a manicured tropical garden. 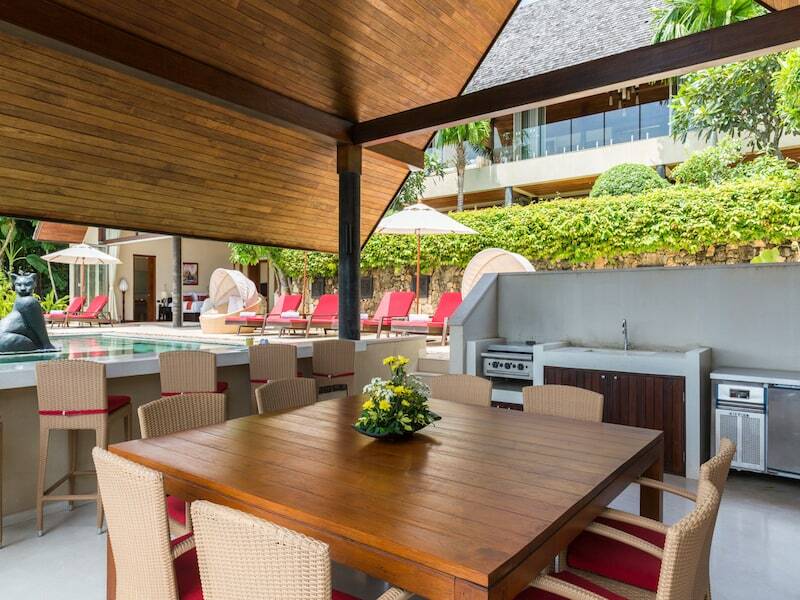 Everything about this villa gives you a comfortable and homely feeling. 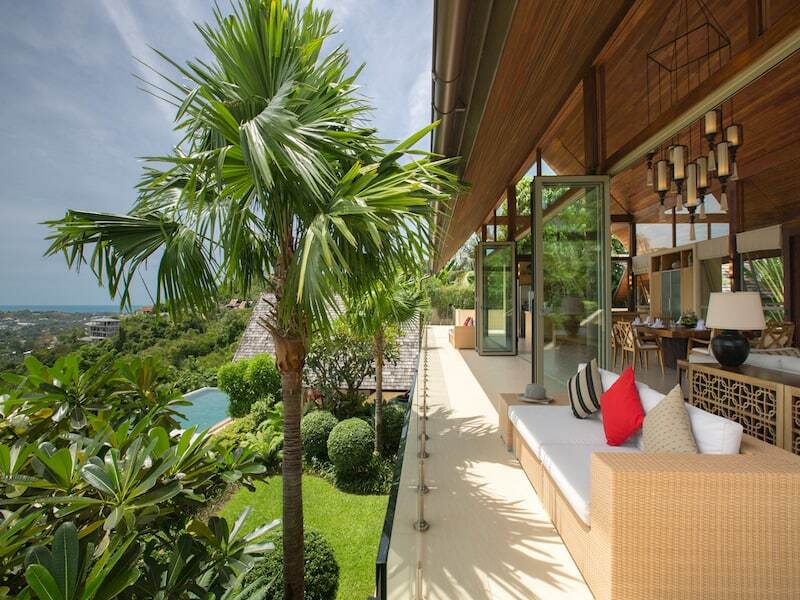 You can imagine spending hours relaxing and enjoying this garden. 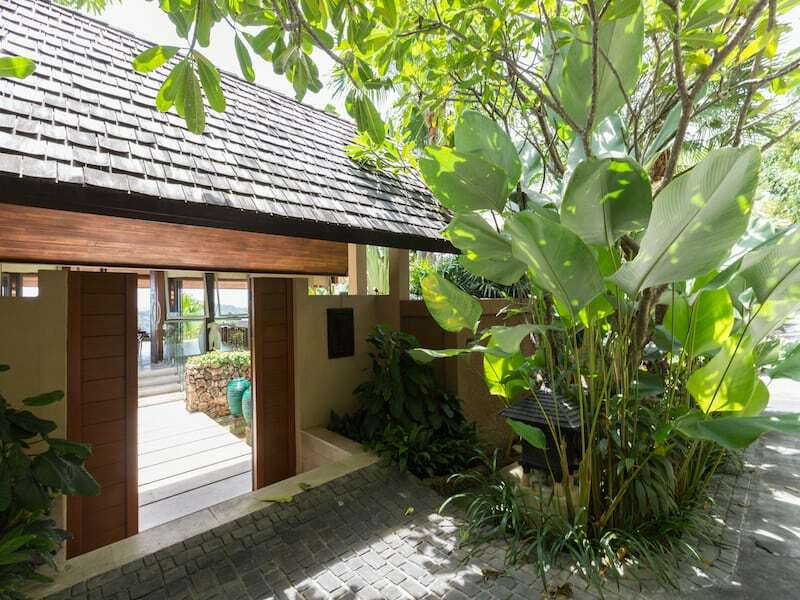 To the right is a large covered driveway and again, adding to the naturalness of the villa, wooden tiles have been used on the roof. 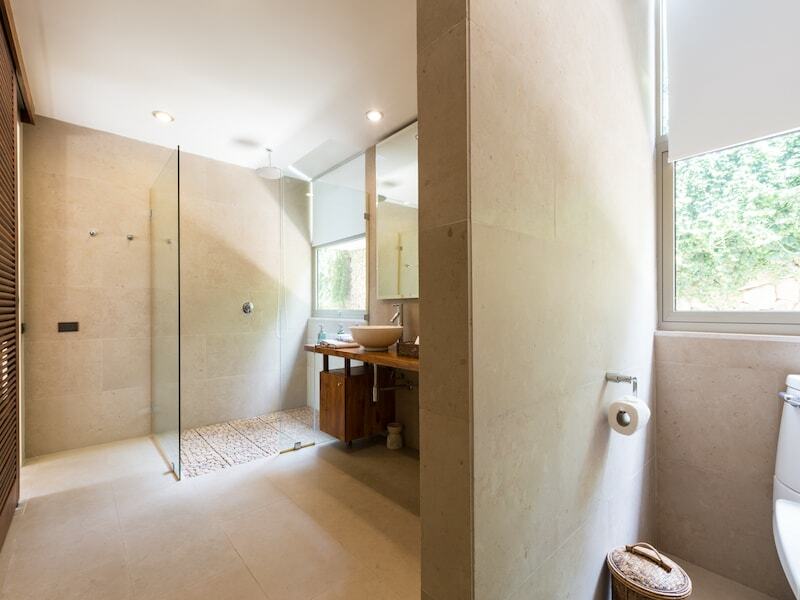 On the way to the main gate there a water feature and natural stone walls. 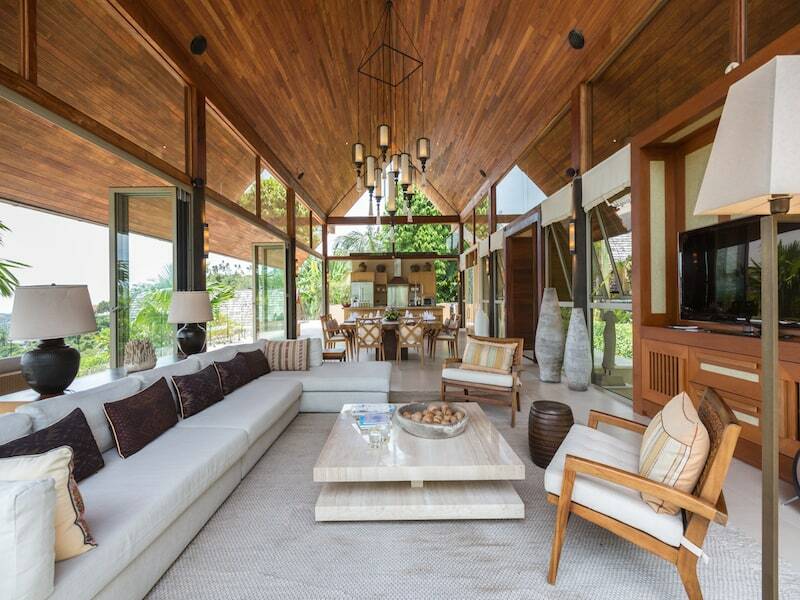 The main wooden doors open into the elevated living area. 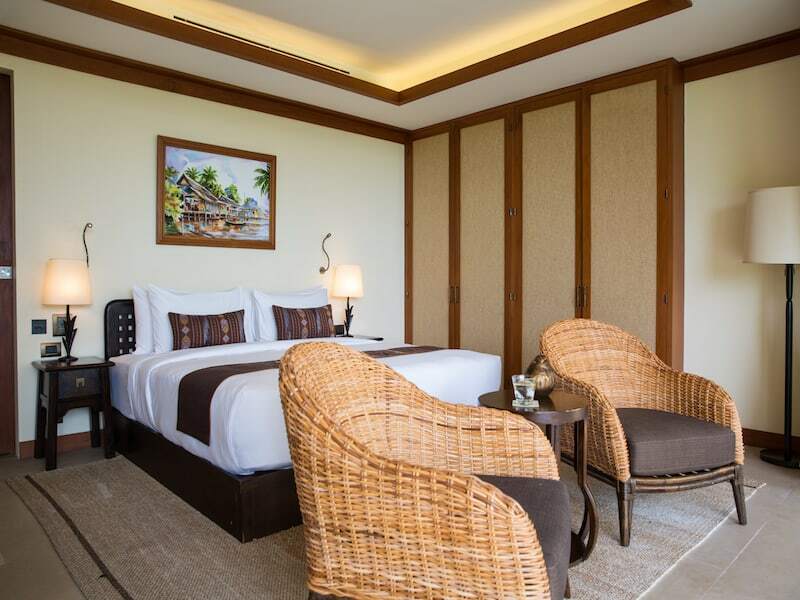 This is a spacious room virtually the whole width of the property and has a very high, wood-lined vaulted ceiling with windows on both sides that increase the feeling of space and adds to the overall grandness of an already impressive room. 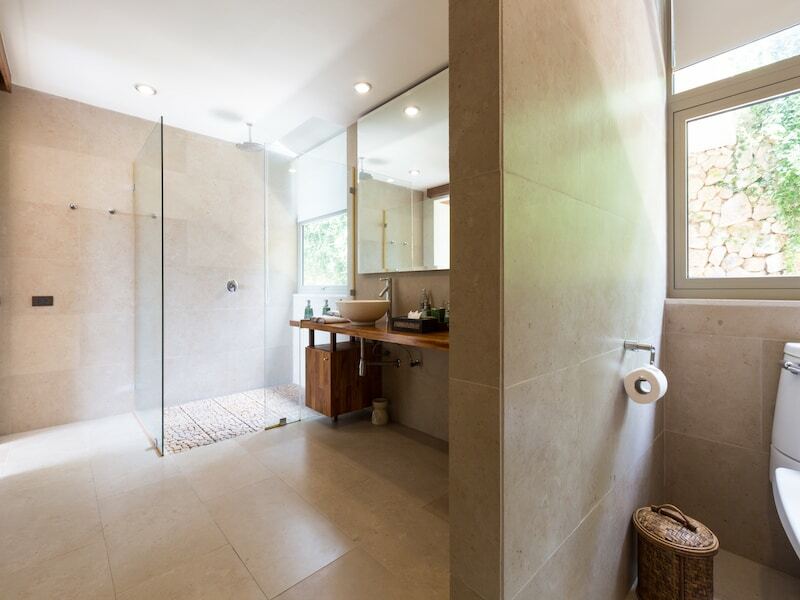 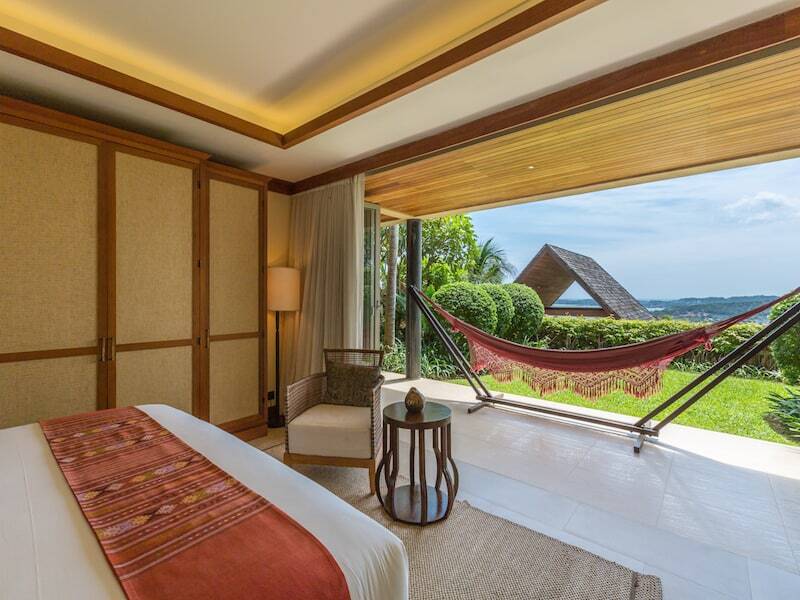 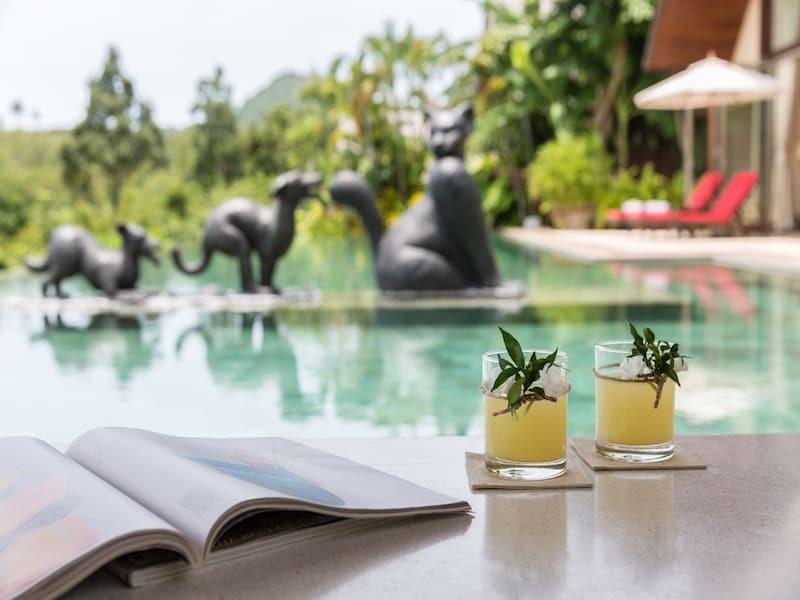 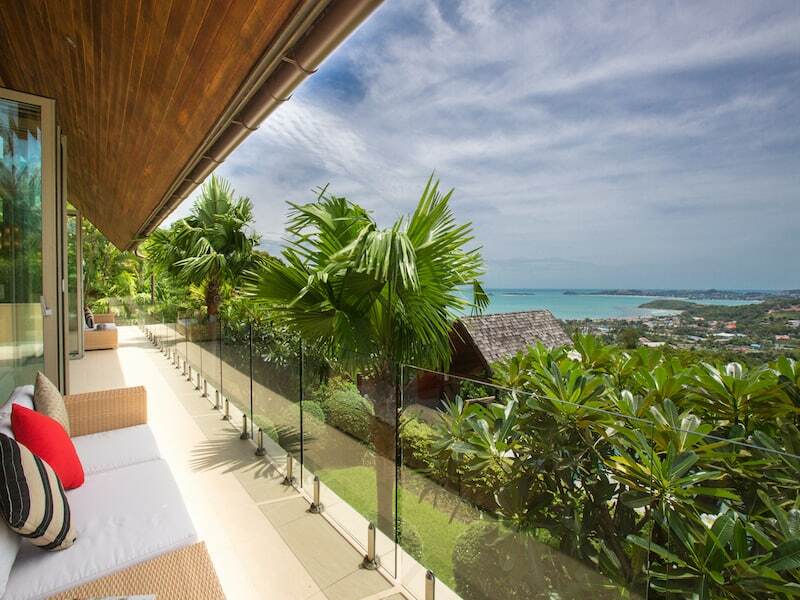 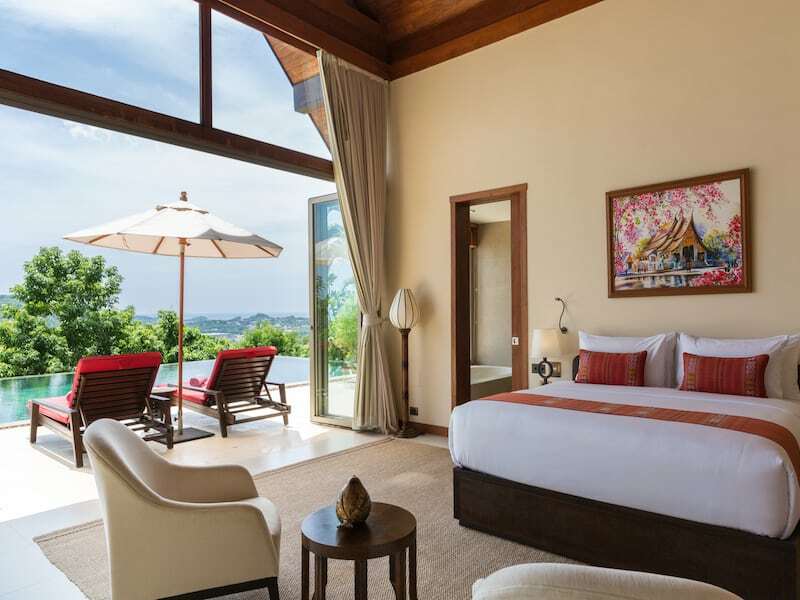 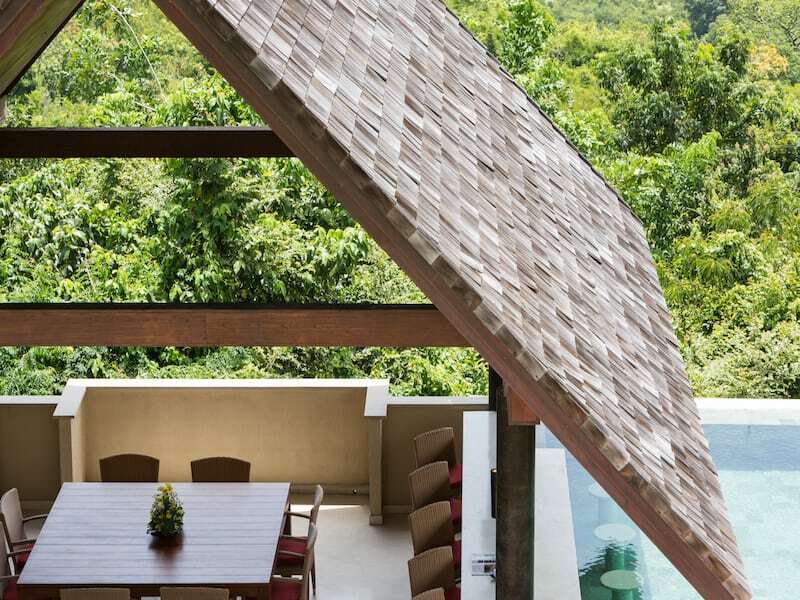 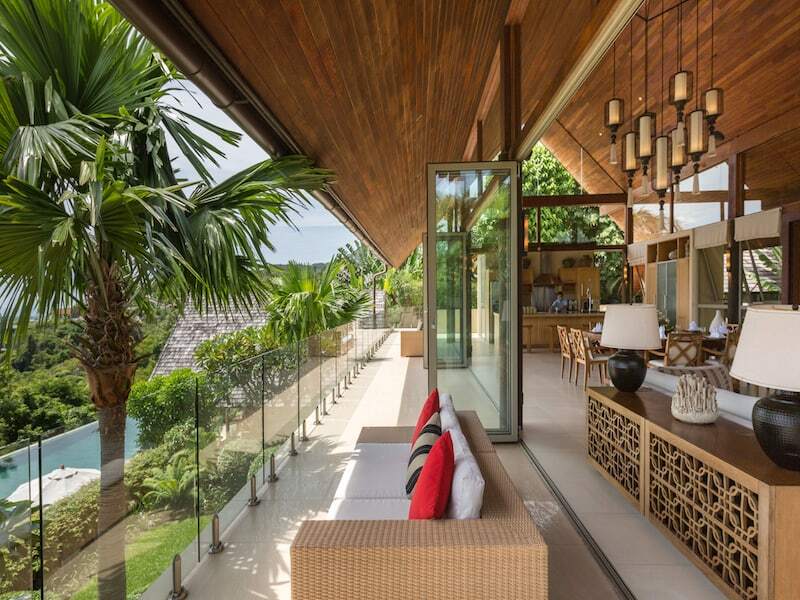 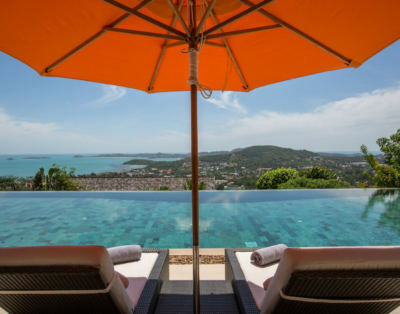 Facing the doors is a wall of bi-folding glass doors ensuring that the panoramic views across the forested valleys, the bay of Bophut and the island of Koh Pha Ngan. 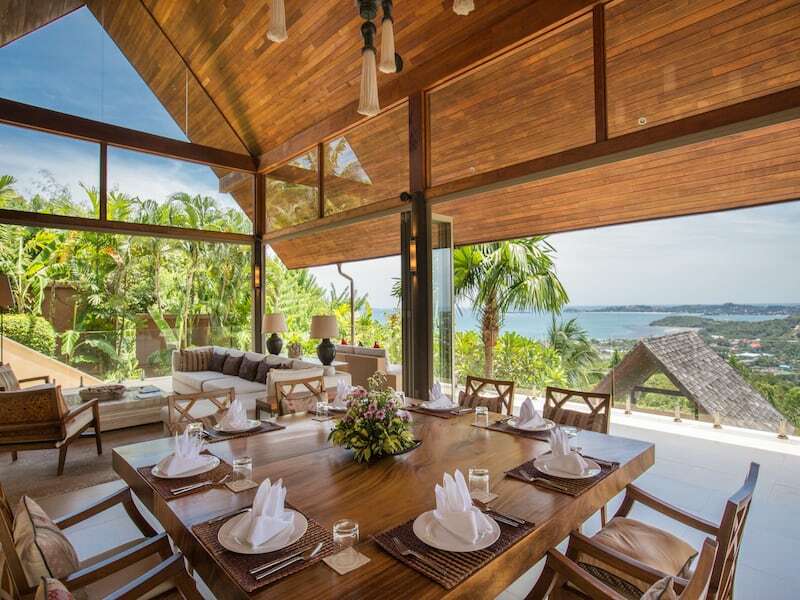 The dining table is set in the center of the room and while you are dining you will enjoy spectacular views of the forest and the sea. 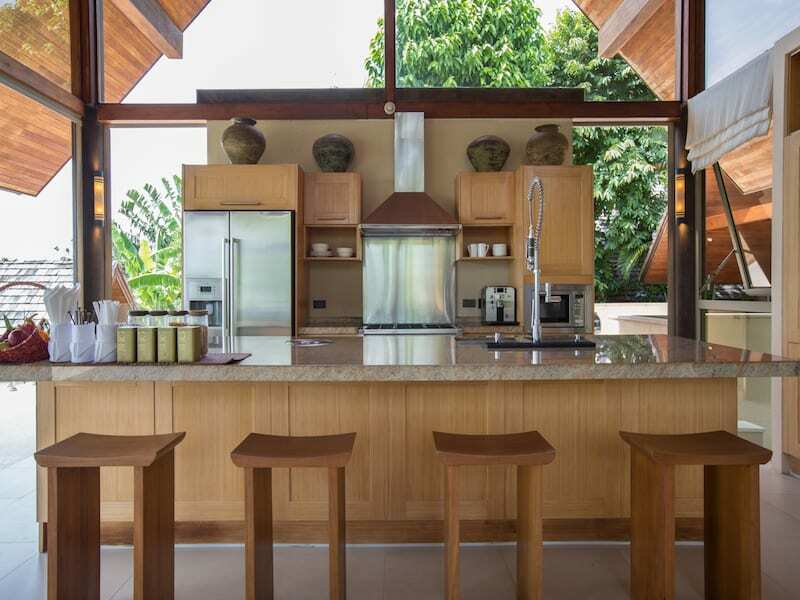 The fully equipped kitchen features light wood units, chrome fittings and marble surfaces, but it is also well planned and designed to include all you need; there’s even a wine cooler sunken into the surface of the island feature. 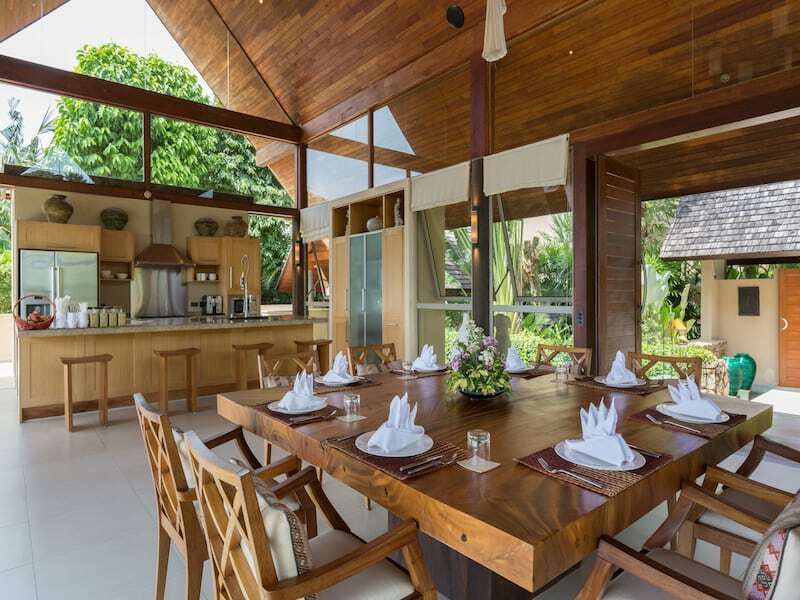 On the opposite side of the dining table is the living area which has a flat-screen TV, furnished with comfortable brown and white sofas and chairs as well as contemporary ornaments and artworks. 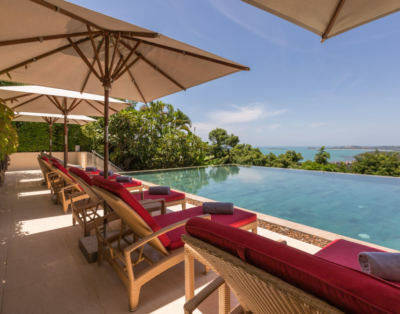 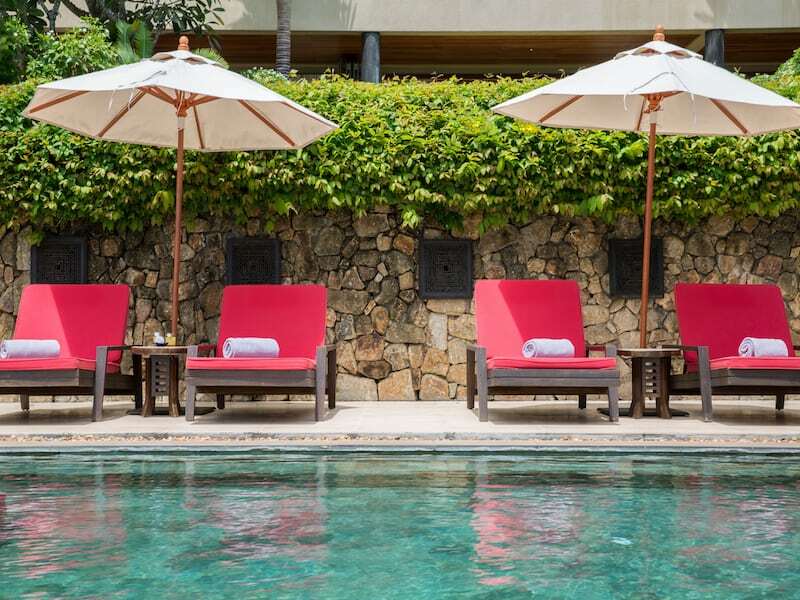 The infinity swimming pool is set surrounding the balcony with views of the garden and the ocean, you’ll love seating and relaxing in of the chairs that surround the swimming pool. 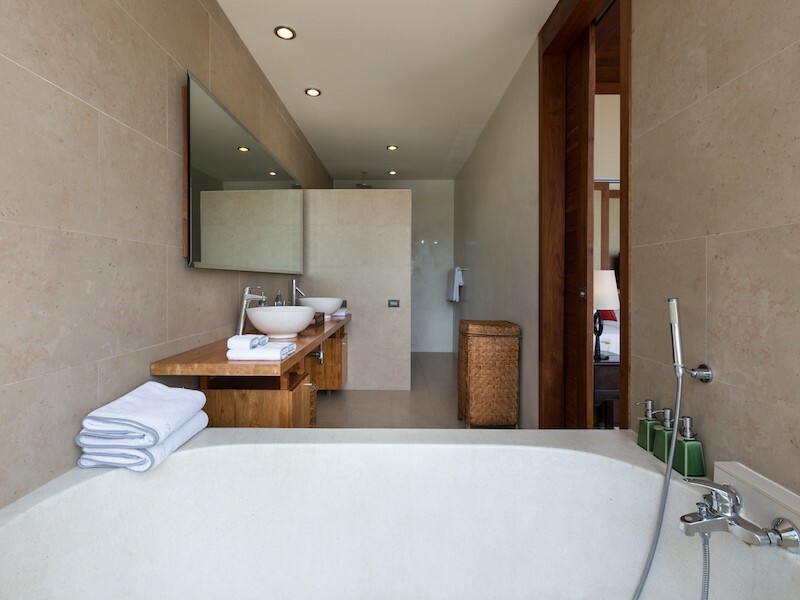 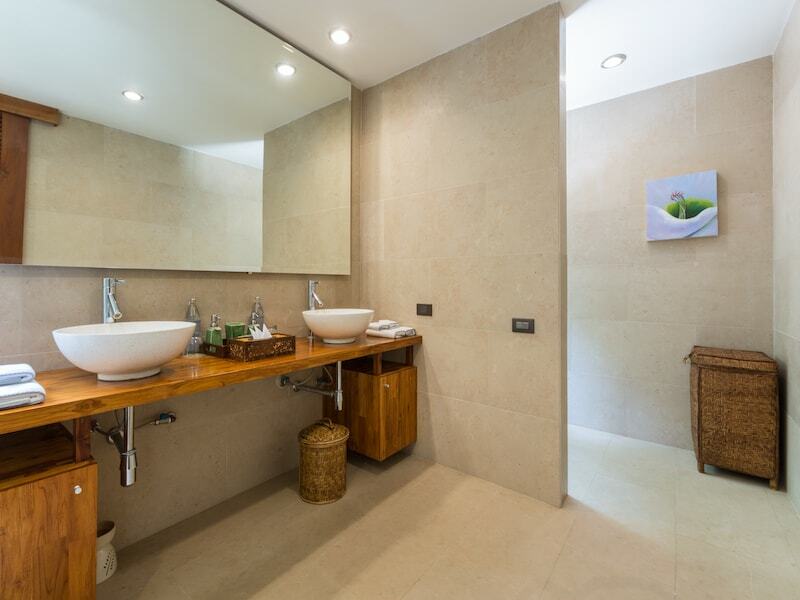 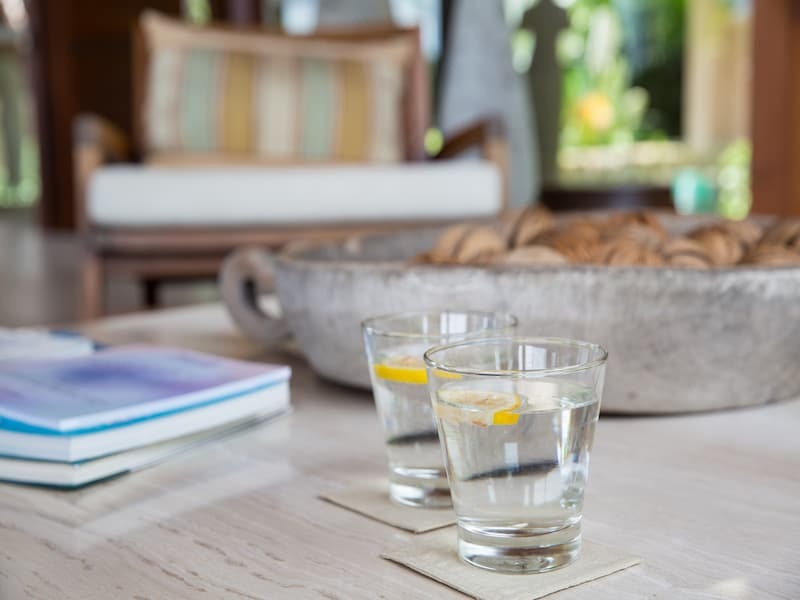 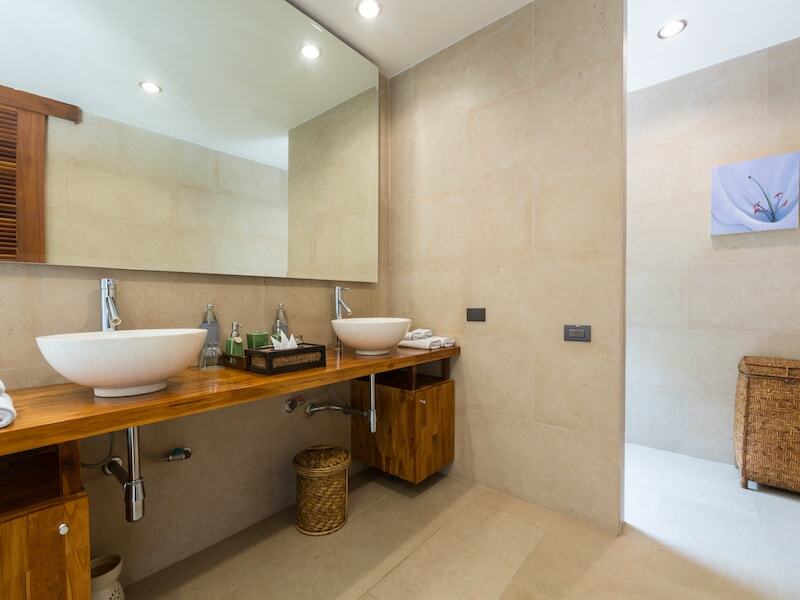 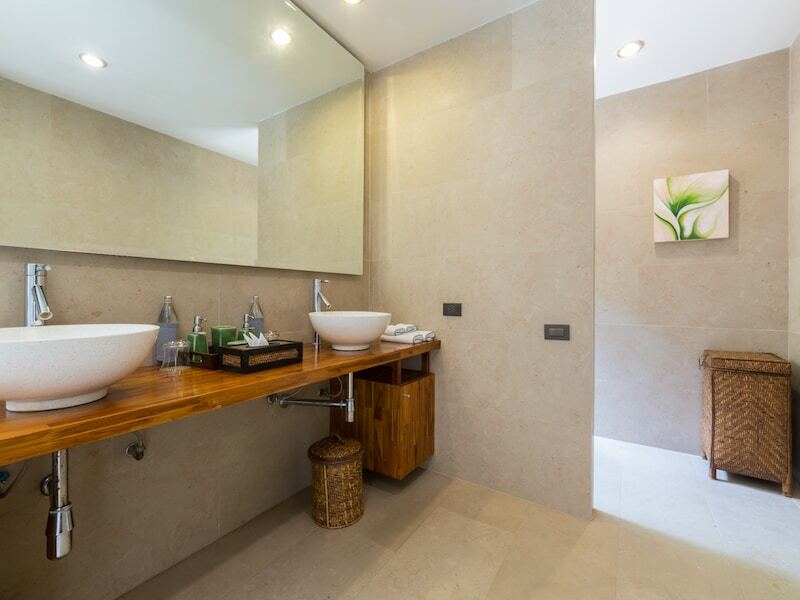 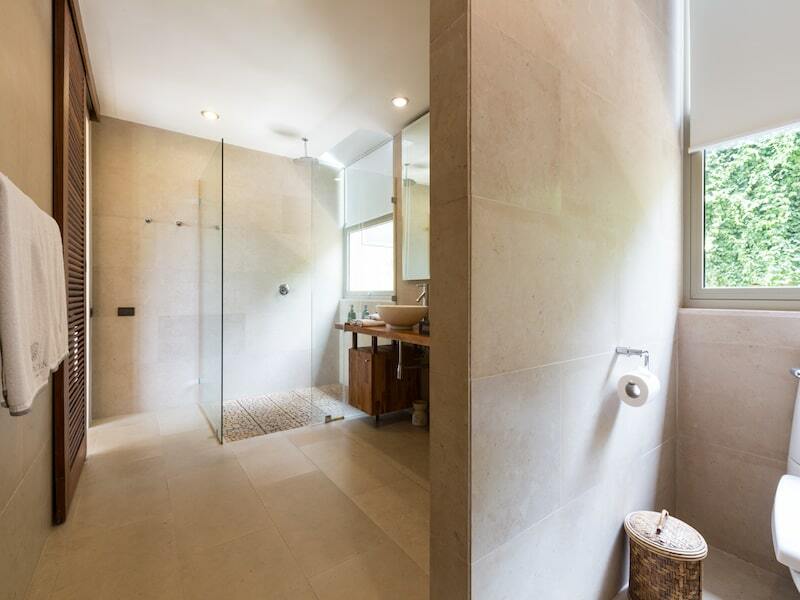 The three suites each have a built-in-wardrobes and a rear en-suite shower room with views out to the water feature and the intricate and beautiful natural stone wall running behind the property and up to the level above. 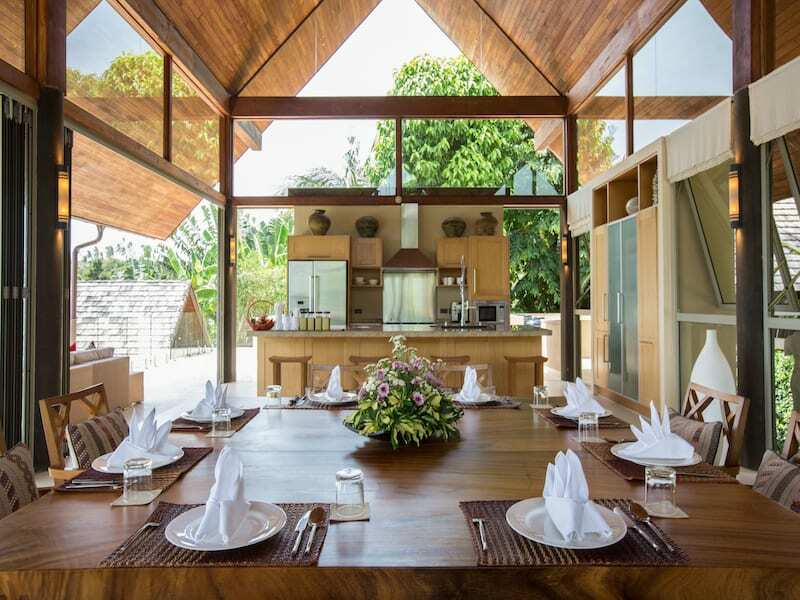 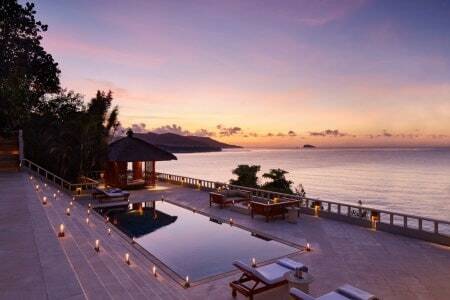 All the suites have king-size double beds making this an ideal family or group villa. 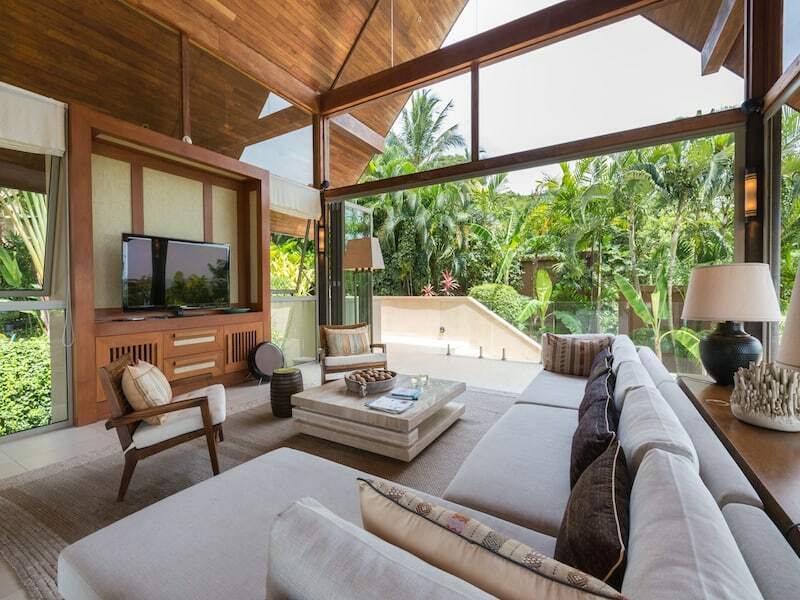 In each, the furniture is high-quality and stylish. 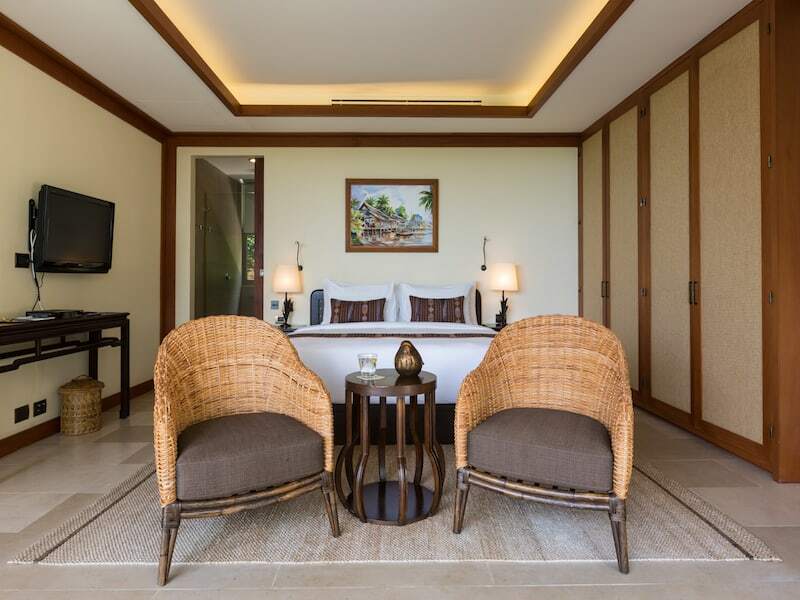 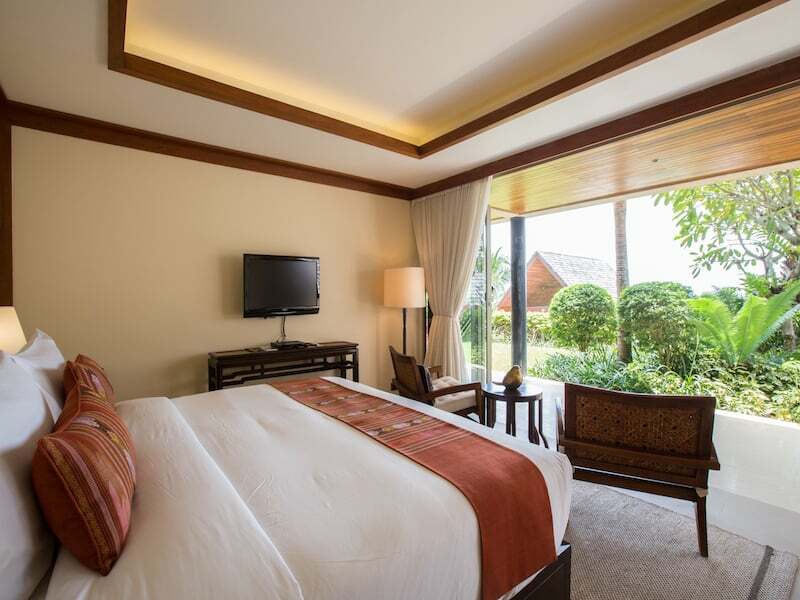 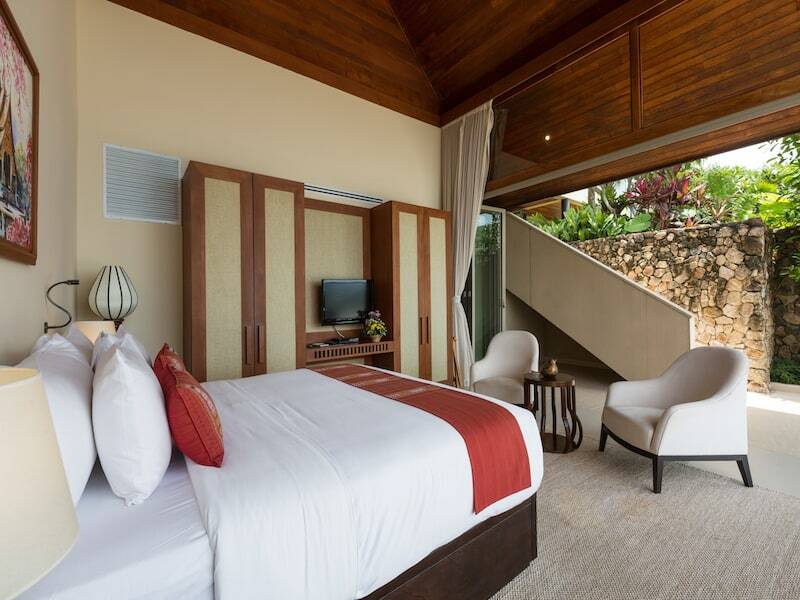 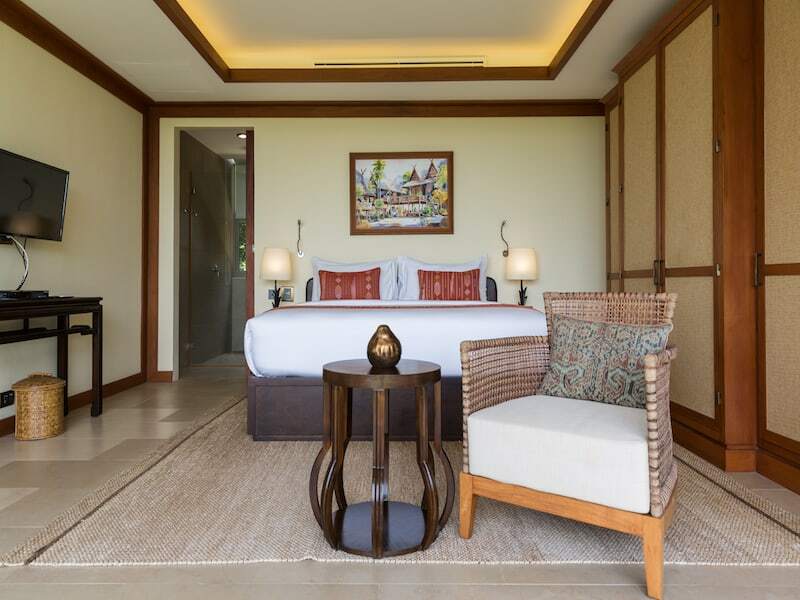 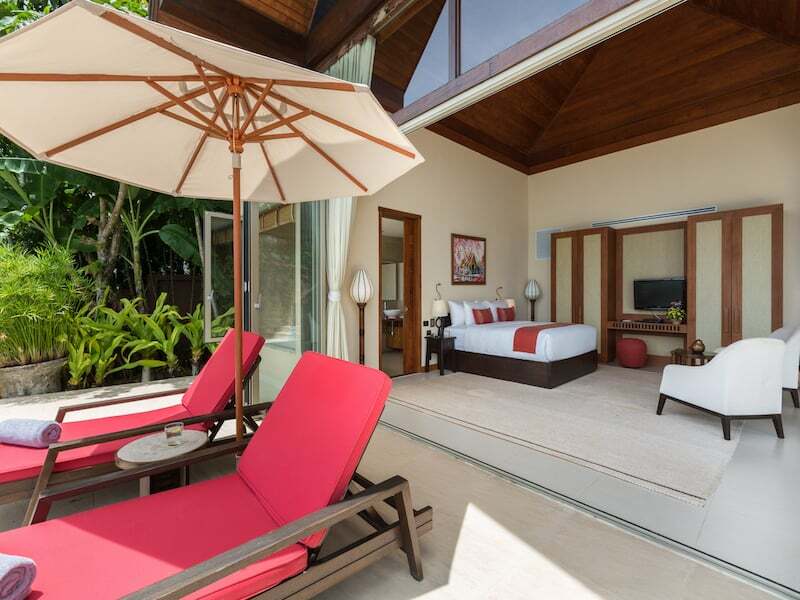 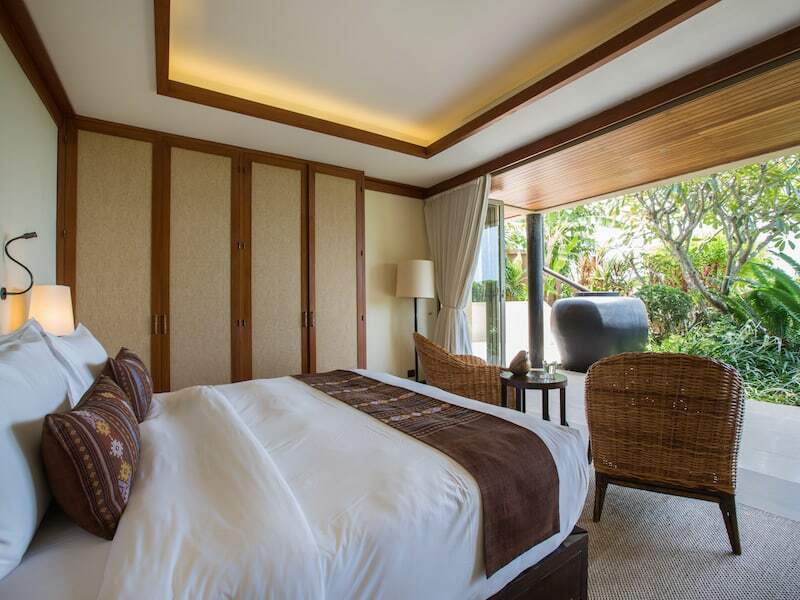 In front of this bedroom, you can enjoy a nice garden with lush tropical trees. 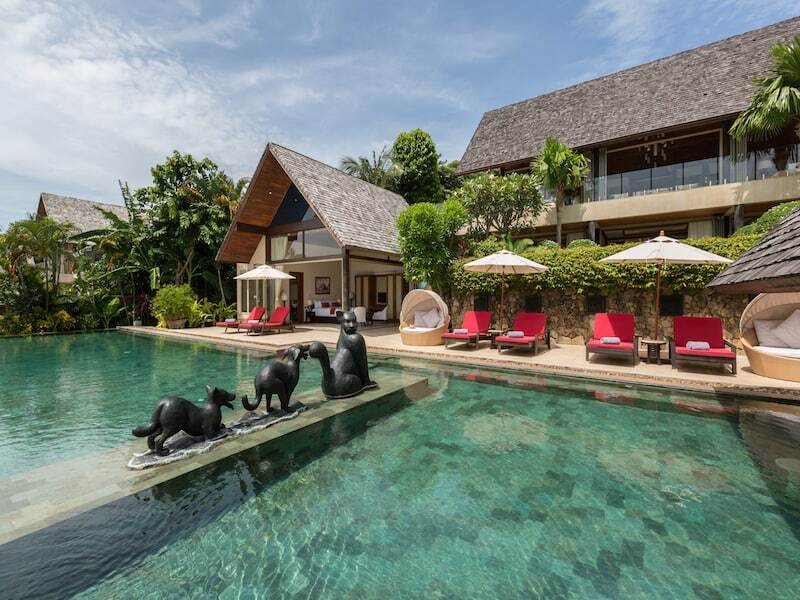 At the very front of the property is the large blue tiled pool. 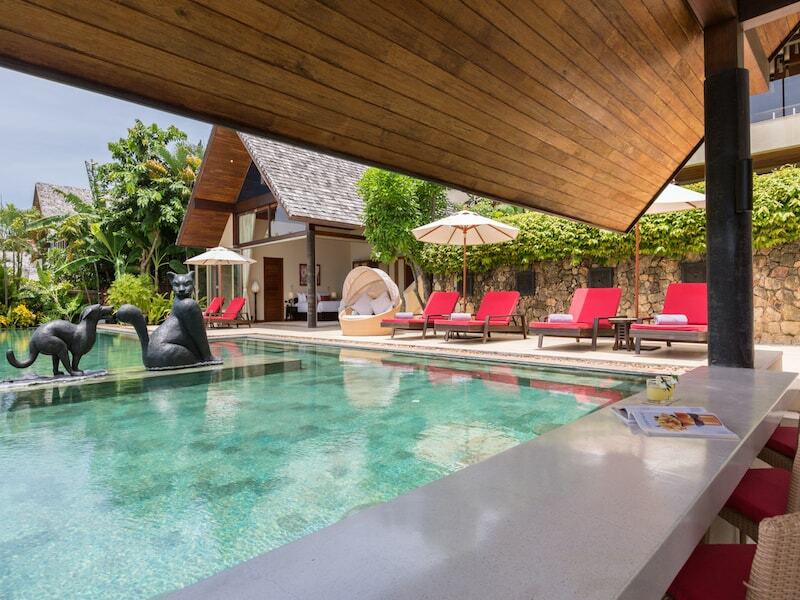 At the left side of the pool, there are stools sunken under the water along the edge of the bar which is incorporated into a sala that also houses a dining table and bench seats. 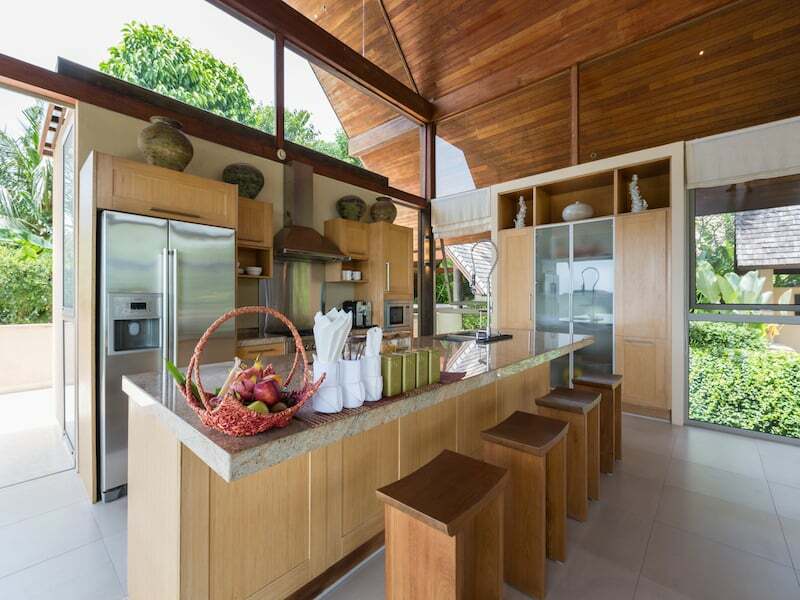 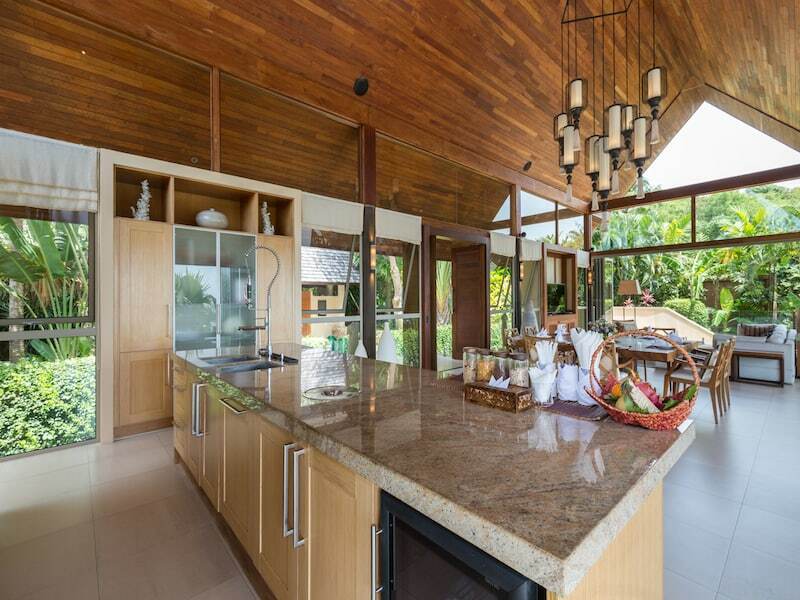 A vaulted wooden ceiling with glass at the front and back creates an airy and light atmosphere. 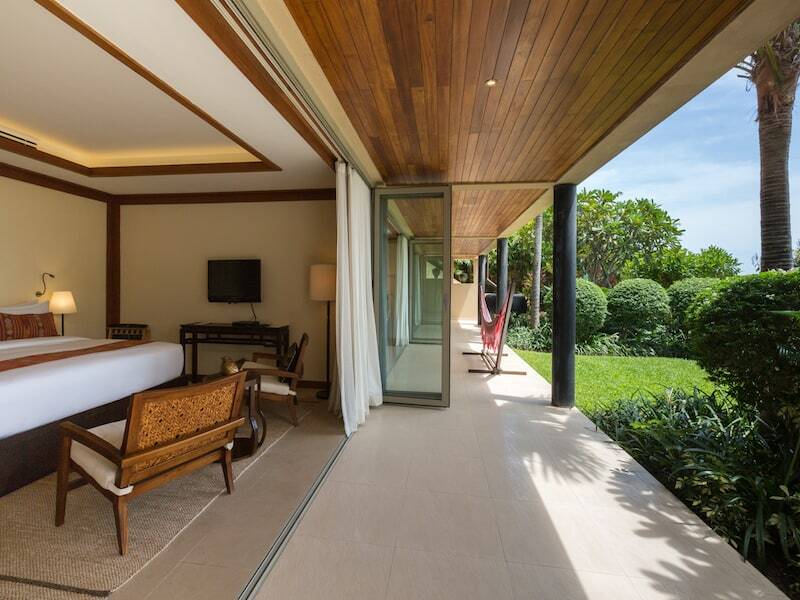 Doors open directly onto the pool terrace and take in the spectacular views. 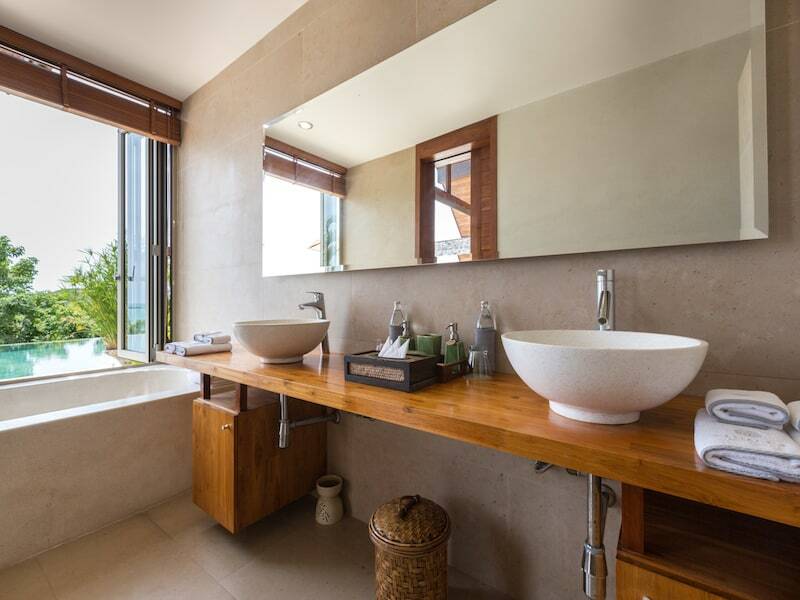 There’s a separate dressing area and an en-suite that has twin sinks, a rain shower and an indulgent terrazzo bathtub with windows looking directly out across the pool and to the ocean. 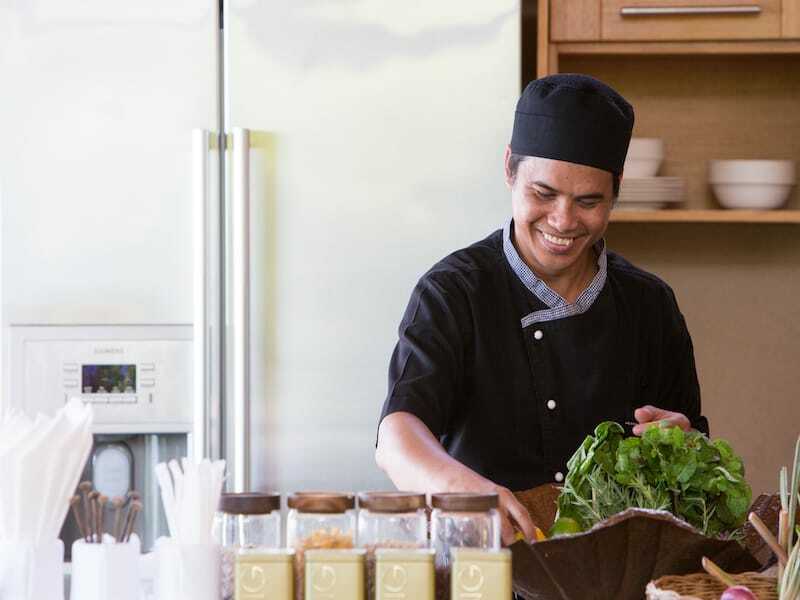 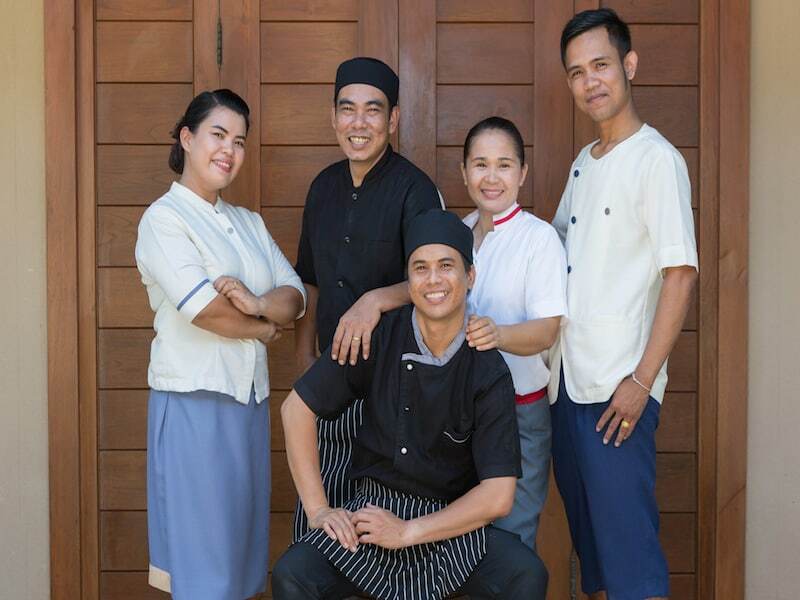 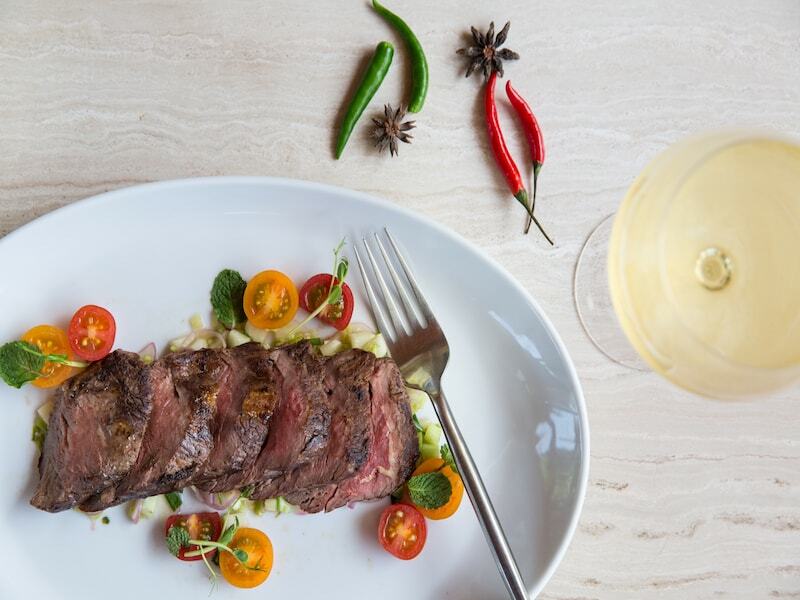 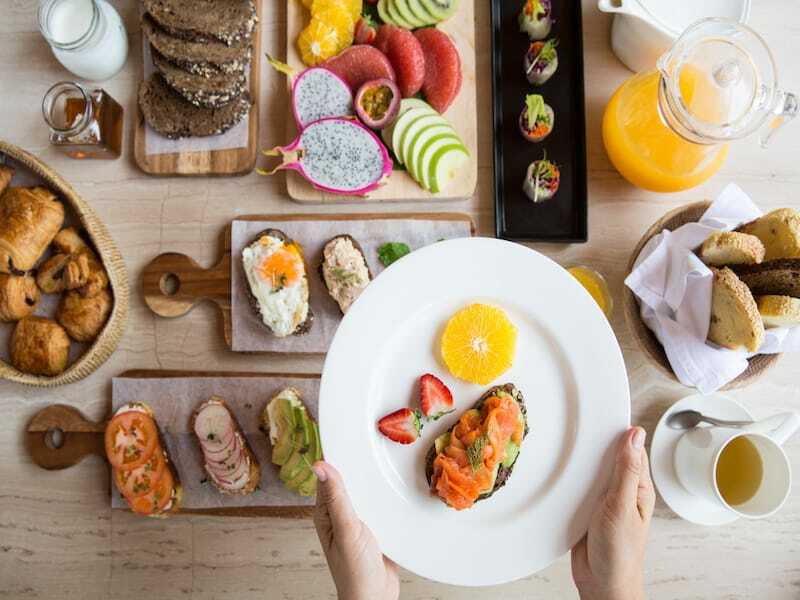 With your own private chef, you can enjoy tailor-designed menus meticulously prepared with fresh local produce and the healthiest of ingredients. 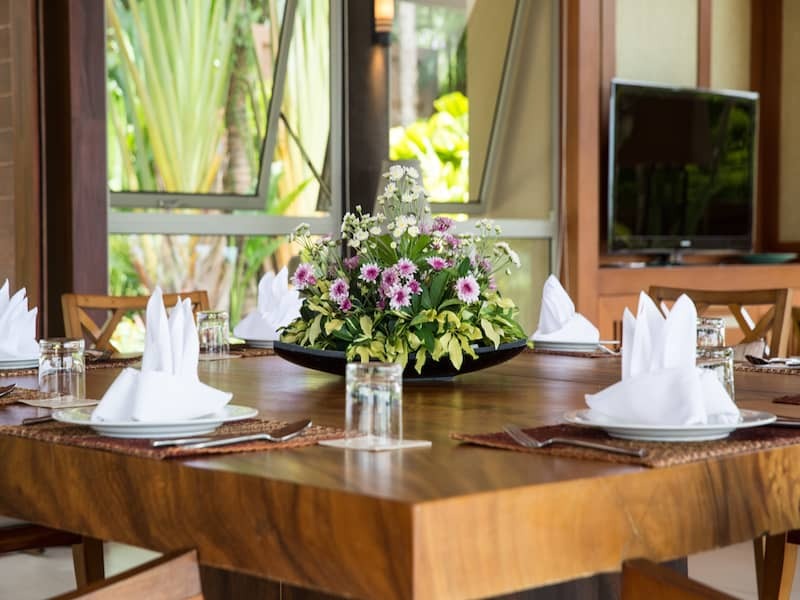 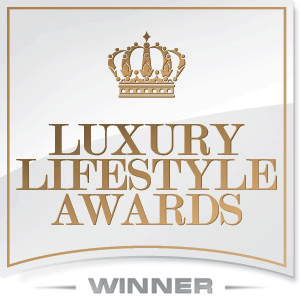 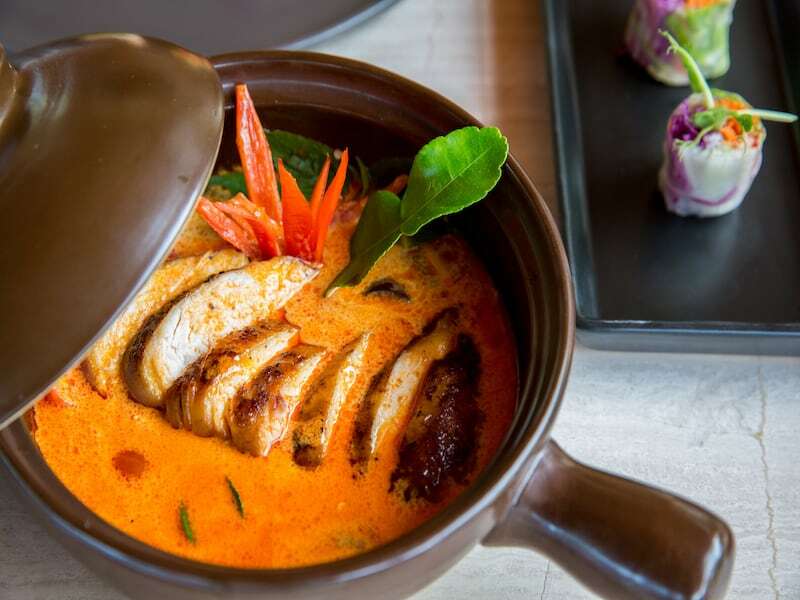 Fine wines compliment the authentic Royal Thai cuisine and Western gastronomy.